Glovers is our newest Specimen pool, with an exciting amount of fish that have hardly been fished for in the past 15 years! The lake opened up for fishing in May 2015 and so far boasts fish over 40lb, with the current lake record at 42.08lb. 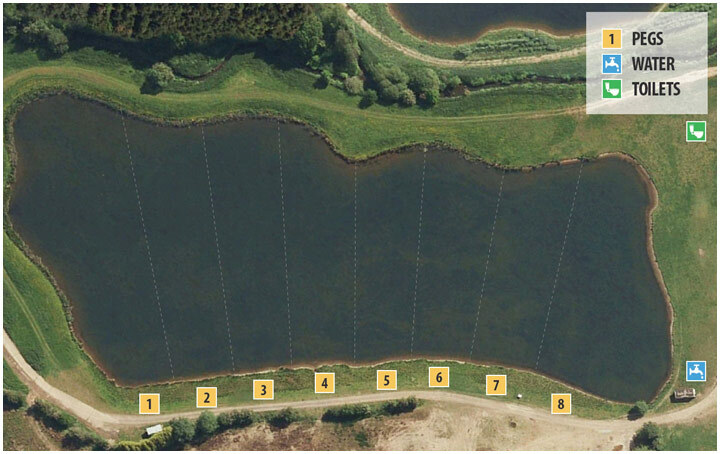 At around 6 acres and with 8 pegs it is the smallest of our 3 specimen lakes but with only 8 pegs it offers a lot of room for the anglers. The swims are setup like Bridge Pool with the pegs along one bank so you can cast to the far bank or fish in your near margins without disturbing your neighbour. An unhooking mat, Landing net, Weigh Sling, and water bucket are supplied with each swim and we ask anglers not to bring their own to reduce the risk of disease. Like the other specimen lakes No Guests are allowed . All gates are open from 9am and locked from 5pm winter and 6pm summer. Bait Boats are allowed on this water as long as they are used appropriately. I watched the carp pick the hookbait up in the gin clear water on Baden Hall's Glovers. It didn't stand a chance! There are numerous large Carp in Glovers with the current lake record standing at a 42.08lb Common. With a healthy head of 20's and 30's (to 35lb +), all providing great runs. Baiting up off the far margins opposite your swim keeps the disturbance down, but fish do get caught closer in to your peg if you're quiet or they are following a fresh warm wind. Try to keep the disturbance down and be quiet and you'll stand more of a chance of catching some quality fish or maybe a fish that has never been caught before, which is still happening. Surface fishing from Spring onwards is also a must try technique. Use of polarised glasses will help you find the far margin clear areas. A variety of freezer baits work well with Mainline Cell-Hybrid and New Grange Bollies, Sticky Baits Krill and Manilla all working well. Dynamite Baits Monster Tiger Nut is a classic along with the new Complex-T baits and liquids. Different seasons fish better with different rigs, some of Glovers favourites are: Naked Chods, Ronnies, Zigs and surface fishing all produce results.